Virgin America stock has dropped more than 30% this year. Are investors overreacting? Less than six months ago, Virgin America (NASDAQ:VA) was one of the hottest IPOs of 2014. But since the calendar flipped to 2015, Virgin America stock has received a few poor ratings from analysts and has fallen out of favor with investors. However, investors' worries about Virgin America are overblown. The company's customers value its superior product and are willing to pay a premium for it. This provides a good foundation for Virgin America to resume its growth later this year. Virgin America stock soared more than 30% on its first day of trading last November, rising from an IPO price of $23 to a closing price of $30. The shares continued gaining ground until the end of the year, peaking at more than $45 in late December. But it's been all downhill from there. Virgin America Stock Chart. Data source: YCharts. 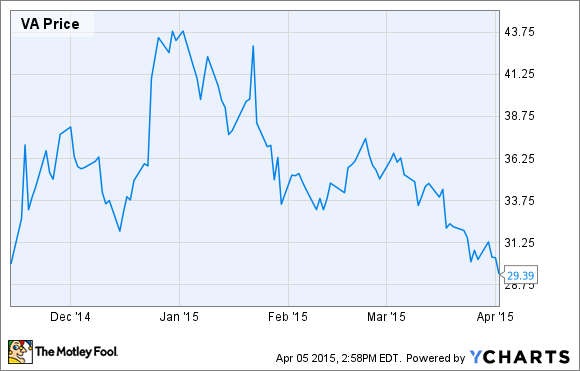 Virgin America stock has since fallen by about 35% in just over three months. One key cause of its decline was a January investor update that forecast a slowdown in unit revenue growth, rising employee compensation costs, and significant fuel hedging losses. More recently, Virgin America has been the target of relatively bearish analyst reports at Stifel and Credit Suisse. This has helped drive fresh waves of selling pressure. It's somewhat surprising that value investors haven't stepped in yet to buy Virgin America stock, because the company is on track for strong earnings growth this year due to lower fuel prices. For Q1, Virgin America has given specific guidance that passenger revenue per available seat mile, or PRASM, will be roughly flat, while non-fuel unit costs will rise by 1%-3%. However, as of mid-February, Virgin America expected to pay $2.45-$2.55/gallon for jet fuel during Q1. That would be down about 20% from the $3.16/gallon Virgin America paid in Q1 2014, despite significant hedging losses. The net result is that whereas Virgin America posted a -4.2% operating margin in Q1 2014, it should be solidly profitable in Q1 this year. On average, analysts are projecting Q1 EPS of $0.14. Non-fuel unit costs will begin rising at a faster rate in Q2, as Virgin America is raising pilot pay by 15% starting this month. (Most other workers will receive raises of about 5%.) However, fuel hedging losses will rapidly decline, so Virgin America could be paying $2/gallon or less for jet fuel by the summer. The additional fuel savings should more than offset the increase in non-fuel unit costs. Furthermore, once Virgin America starts growing again this fall, the non-fuel unit cost increases should subside. The carrier will add 10 new A320s within a one-year period, starting this summer. They will have 149 seats, whereas many of Virgin America's current A320s have 146 seats. The new planes will also be equipped with fuel-saving Sharklet winglets. These improvements will lead to lower unit costs for Virgin America. The carrier will also benefit from spreading its fixed costs over more flights. Virgin America will resume its growth this fall. Source: Virgin America. Meanwhile, Virgin America's unit revenue trajectory could improve later this year as its new routes at Dallas Love Field begin to mature. Virgin America also hopes to keep growing its ancillary revenue, thanks in part to new revenue management tools it will roll out later this quarter. On average, analysts currently expect Virgin America to post EPS of $4.47 this year. Virgin America stock thus trades for less than 7 times expected 2015 earnings. For 2016, analysts are projecting that revenue will rise 14% to $1.74 billion thanks to capacity growth, but they do not think that growth will be profitable. The average EPS estimate is $4.26, which represents a projected decline of nearly 5%. It's true that new airline routes can often take two to three years to mature to profitability. That said, while some of Virgin America's new routes might lose money at first, much of this impact could be offset by improving profitability for the routes it started at Love Field in late 2014. Additionally, Virgin America's accelerating growth should help reduce its unit costs. Assuming fuel prices remain roughly flat, there could be upside to analysts' estimates for 2016. But even if EPS takes a step back in 2016, Virgin America's growth and the maturing of its newer routes should push EPS higher over the next few years. Given this relatively favorable outlook, Virgin America stock should probably be trading at a significantly higher valuation.